I thought St. Patrick’s Day would be the perfect time to break out the marshmallows and crisp rice cereal and whip up a batch of shamrock shaped cereal treats. As usual, I didn’t leave my shamrock pops plain. I couldn’t resist adding silly faces using candy eyes, green M&M’s and a black food coloring marker. 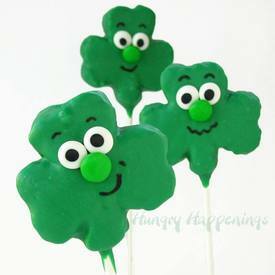 Each little shamrock shaped cereal treat that I created has it’s own unique personality and all are quite cute.